GDP is the total market value of all final goods and services produced in a country in a given year. Each country reports its data in its own currency. To compare the data, each country's statistics must be converted into a common currency. Two methods are used for conversion, nominal and purchasing power parity (PPP). 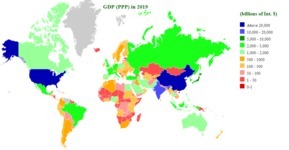 In purchasing power parity (PPP) exchange rate — the rate at which the currency of one country would have to be converted into that of another country to buy the same amount of goods and services in each country. IMF explains, "If a hamburger is selling in London for £2 and in New York for $4, this would imply a PPP exchange rate of 1 pound to 2 U.S. dollars". On the PPP basis, China is world's largest economy in 2018. Total wealth of china is estimated at 25.3 trillion international dollar. China is followed by United States with figure 19.4 trillion. India, which is 7th largest economy in nominal terms, is at third place. Tuvalu is the world's smallest national economy with a GDP (PPP) of approximately Int. $44 million. 25 economies have gdp greater than $1 trillion. Pakistan is latest entry in $1 trillion economy. 85 have greater than $100 billion. Top 20 economies add up to over 75%. 82 smallest economies only contribute 1 % in world gdp and 151 lowest ranked constitute only 10 % of total. 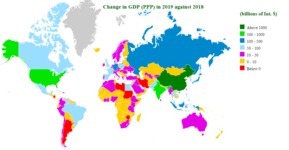 Top Gainers in 2018: At current prices, GDP of world in 2018, is expanded by Int. $7,747 bn. China is the largest contributor of global GDP growth. GDP of China has grown by Int. $2,105 billion in 2018. United States is second largest contributer with Int. $1,028 billion. With data Int. $928 India is third largest contributer. Top Losers in 2018: At current prices, Out of 193 economies estimated by IMF, 10 economies have shrunk in 2018. Venezuela is at top by shrinking Int. $61 bn. second highest loser Argentina has declined by only 3 bn. Changes in rank: Armenia is highest gainer in World GDP (PPP) Ranking as its moved 5 positions up followed by Burkina Faso	(+3). Equatorial Guinea	and Venezuela are biggest loser in World GDP (PPP) Ranking as rank of both has moved down by 8 positions. 1 China $23,120,000,000,000 2017 est. 3 United States $19,360,000,000,000 2017 est. 4 India $9,447,000,000,000 2017 est. 5 Japan $5,405,000,000,000 2017 est. 6 Germany $4,150,000,000,000 2017 est. 7 Russia $4,000,000,000,000 2017 est. 8 Indonesia $3,241,000,000,000 2017 est. 9 Brazil $3,230,000,000,000 2017 est. 10 United Kingdom $2,880,000,000,000 2017 est. 12 Mexico $2,406,000,000,000 2017 est. 13 Italy $2,307,000,000,000 2017 est. 14 Turkey $2,133,000,000,000 2017 est. 15 Korea, South $2,028,000,000,000 2017 est. 16 Saudi Arabia $1,796,000,000,000 2017 est. 17 Spain $1,769,000,000,000 2017 est. 18 Canada $1,764,000,000,000 2017 est. 19 Iran $1,631,000,000,000 2017 est. 20 Australia $1,235,000,000,000 2017 est. 21 Thailand $1,229,000,000,000 2017 est. 22 Egypt $1,199,000,000,000 2017 est. 23 Taiwan $1,175,000,000,000 2017 est. 24 Nigeria $1,118,000,000,000 2017 est. 25 Poland $1,118,000,000,000 2017 est. 26 Pakistan $1,056,000,000,000 2017 est. 27 Malaysia $926,100,000,000 2017 est. 28 Argentina $919,500,000,000 2017 est. 29 Netherlands $916,400,000,000 2017 est. 30 Philippines $875,300,000,000 2017 est. 31 South Africa $757,300,000,000 2017 est. 32 Colombia $713,000,000,000 2017 est. 33 United Arab Emirates $691,900,000,000 2017 est. 34 Bangladesh $674,500,000,000 2017 est. 35 Iraq $652,600,000,000 2017 est. 36 Vietnam $647,000,000,000 2017 est. 37 Algeria $629,300,000,000 2017 est. 38 Belgium $528,300,000,000 2017 est. 39 Sweden $521,700,000,000 2017 est. 40 Switzerland $516,700,000,000 2017 est. 41 Singapore $504,900,000,000 2017 est. 42 Romania $479,000,000,000 2017 est. 43 Kazakhstan $474,300,000,000 2017 est. 44 Hong Kong $454,400,000,000 2017 est. 45 Chile $452,100,000,000 2017 est. 46 Peru $424,600,000,000 2017 est. 47 Austria $417,200,000,000 2017 est. 48 Venezuela $389,400,000,000 2017 est. 49 Norway $375,900,000,000 2017 est. 50 Czechia $375,800,000,000 2017 est. 51 Ukraine $366,400,000,000 2017 est. 52 Ireland $344,800,000,000 2017 est. 53 Qatar $341,700,000,000 2017 est. 54 Burma $332,300,000,000 2017 est. 55 Israel $315,600,000,000 2017 est. 56 Portugal $311,300,000,000 2017 est. 57 Kuwait $302,500,000,000 2017 est. 58 Greece $299,500,000,000 2017 est. 59 Morocco $297,800,000,000 2017 est. 60 Denmark $285,500,000,000 2017 est. 61 Hungary $285,200,000,000 2017 est. 62 Sri Lanka $278,200,000,000 2017 est. 63 Finland $241,500,000,000 2017 est. 64 Uzbekistan $221,700,000,000 2017 est. 65 Ethiopia $195,800,000,000 2017 est. 66 Angola $192,000,000,000 2017 est. 67 Ecuador $190,700,000,000 2017 est. 68 Oman $187,900,000,000 2017 est. 69 Sudan $186,800,000,000 2017 est. 70 New Zealand $185,700,000,000 2017 est. 71 Slovakia $178,700,000,000 2017 est. 72 Belarus $175,900,000,000 2017 est. 73 Dominican Republic $172,600,000,000 2017 est. 74 Azerbaijan $167,200,000,000 2017 est. 75 Kenya $163,500,000,000 2017 est. 76 Tanzania $162,800,000,000 2017 est. 77 Bulgaria $153,000,000,000 2017 est. 79 Tunisia $137,100,000,000 2017 est. 80 Cuba $137,000,000,000 2017 est. 82 Puerto Rico $127,300,000,000 2017 est. 83 Serbia $106,600,000,000 2017 est. 84 Turkmenistan $103,500,000,000 2017 est. 85 Croatia $100,300,000,000 2017 est. 86 Panama $99,430,000,000 2017 est. 87 Cote d'Ivoire $96,270,000,000 2017 est. 88 Uganda $91,500,000,000 2017 est. 89 Lithuania $90,700,000,000 2017 est. 90 Jordan $88,870,000,000 2017 est. 91 Lebanon $87,890,000,000 2017 est. 92 Costa Rica $85,200,000,000 2017 est. 93 Bolivia $83,500,000,000 2017 est. 94 Cameroon $81,550,000,000 2017 est. 95 Nepal $78,550,000,000 2017 est. 96 Uruguay $78,410,000,000 2017 est. 97 Macau $73,580,000,000 2017 est. 98 Slovenia $71,040,000,000 2017 est. 99 Bahrain $70,330,000,000 2017 est. 100 Afghanistan $69,510,000,000 2017 est. 101 Yemen $68,950,000,000 2017 est. 102 Zambia $68,900,000,000 2017 est. 103 Paraguay $68,050,000,000 2017 est. 104 Congo, Democratic Republic of the $67,990,000,000 2017 est. 105 Cambodia $64,210,000,000 2017 est. 106 Luxembourg $63,430,000,000 2017 est. 107 Libya $63,140,000,000 2017 est. 108 El Salvador $56,960,000,000 2017 est. 109 Latvia $53,940,000,000 2017 est. 111 Laos $49,210,000,000 2017 est. 112 Honduras $45,680,000,000 2017 est. 113 Bosnia and Herzegovina $43,850,000,000 2017 est. 114 Senegal $43,070,000,000 2017 est. 115 Trinidad and Tobago $42,780,000,000 2017 est. 116 Estonia $41,320,000,000 2017 est. 117 Mali $40,980,000,000 2017 est. 118 Korea, North $40,000,000,000 2015 est. 119 Madagascar $39,750,000,000 2017 est. 120 Mongolia $39,550,000,000 2017 est. 121 Botswana $39,550,000,000 2017 est. 122 Georgia $39,520,000,000 2017 est. 123 Mozambique $37,010,000,000 2017 est. 124 Gabon $36,750,000,000 2017 est. 125 Nicaragua $36,220,000,000 2017 est. 126 Albania $35,870,000,000 2017 est. 127 Burkina Faso $35,680,000,000 2017 est. 128 Zimbabwe $33,870,000,000 2017 est. 129 Brunei $32,910,000,000 2017 est. 130 Macedonia $31,550,000,000 2017 est. 131 Cyprus $31,190,000,000 2017 est. 132 Papua New Guinea $30,460,000,000 2017 est. 133 Chad $29,640,000,000 2017 est. 134 Equatorial Guinea $29,380,000,000 2017 est. 135 Congo, Republic of the $29,160,000,000 2017 est. 136 Tajikistan $27,670,000,000 2017 est. 137 Mauritius $27,440,000,000 2017 est. 138 Armenia $27,210,000,000 2017 est. 139 Namibia $27,020,000,000 2017 est. 140 Guinea $26,450,000,000 2017 est. 141 Jamaica $25,900,000,000 2017 est. 142 Benin $25,290,000,000 2017 est. 143 Rwanda $24,610,000,000 2017 est. 144 Kyrgyzstan $22,640,000,000 2017 est. 145 Niger $21,790,000,000 2017 est. 146 West Bank $21,220,000,000 2014 est. 147 Malawi $21,150,000,000 2016 est. 148 Moldova $20,160,000,000 2017 est. 149 Haiti $19,880,000,000 2017 est. 150 Kosovo $19,490,000,000 2017 est. 151 Malta $18,530,000,000 2017 est. 152 Iceland $17,730,000,000 2017 est. 153 Somalia $17,470,000,000 2017 est. 154 Mauritania $17,370,000,000 2017 est. 155 Togo $12,430,000,000 2017 est. 156 Sierra Leone $11,750,000,000 2017 est. 157 Eswatini $11,340,000,000 2017 est. 158 New Caledonia $11,110,000,000 2017 est. 159 South Sudan $11,070,000,000 2017 est. 160 Montenegro $11,010,000,000 2017 est. 161 Eritrea $9,631,000,000 2017 est. 162 Bahamas, The $9,339,000,000 2017 est. 163 Fiji $8,647,000,000 2017 est. 164 Suriname $8,406,000,000 2017 est. 165 Burundi $7,985,000,000 2017 est. 167 Lesotho $7,448,000,000 2017 est. 168 Bhutan $7,011,000,000 2017 est. 169 Maldives $6,896,000,000 2017 est. 171 Guyana $6,367,000,000 2017 est. 172 Timor-Leste $6,211,000,000 2017 est. 176 French Polynesia $5,490,000,000 2015 est. 177 Liechtenstein $4,978,000,000 2014 est. 178 Barbados $4,919,000,000 2017 est. 179 Liberia $3,906,000,000 2017 est. 181 Cabo Verde $3,734,000,000 2017 est. 182 Djibouti $3,640,000,000 2017 est. 183 Gambia, The $3,582,000,000 2017 est. 185 Central African Republic $3,395,000,000 2017 est. 187 Belize $3,230,000,000 2017 est. 188 Curacao $3,128,000,000 2012 est. 189 Guinea-Bissau $3,071,000,000 2017 est. 190 Seychelles $2,736,000,000 2017 est. 191 Aruba $2,516,000,000 2009 est. 193 Saint Lucia $2,422,000,000 2017 est. 195 Antigua and Barbuda $2,390,000,000 2017 est. 196 San Marino $2,083,000,000 2017 est. 199 Grenada $1,620,000,000 2017 est. 201 Comoros $1,323,000,000 2017 est. 202 Saint Vincent and the Grenadines $1,281,000,000 2017 est. 204 Solomon Islands $1,238,000,000 2017 est. 205 Samoa $1,130,000,000 2017 est. 207 Dominica $851,000,000 2017 est. 208 Vanuatu $787,000,000 2017 est. 209 Sao Tome and Principe $682,000,000 2017 est. 217 Palau $301,000,000 2017 est. 218 Cook Islands $299,900,000 2016 est. 220 Kiribati $224,000,000 2017 est.